At the recent AAE Convention, Dr. Hessam Nowzari presented a lecture on implant outcomes. Dr. Nowzari is a diplomate of the American Board of Periodontology and the former director of advanced periodontics at USC from 1995 to 2012. Dr. Nowzari discussed the difference between the tooth and an implant from a unique perspective. Often left out of the discussion regarding implants is the importance of the periodontium and how loss of the the periodontium (tooth, periodontal ligament, dental papilla, supracrestal fibers, lamina dura) affects the remaining gingival esthetics, including the esthetics around the dental implant. It is well known that anterior gingival esthetics around an implant are one of the most challenging parts of implant dentistry. The reason this is so challenging, is that the natural periodontal tissues (see image) that give the gingiva it's phenotype (appearance) are gone. An implant's best chance at "natural-looking" gingiva/papilla is a natural tooth next door! Dental papilla belong to teeth. While implants have an important part in dentistry, an implant can never effectively reform the periodontium. The bundle bone and the family of fibers (dentogingival, dentoperiosteal, alveologingival, periosteogingival, interpapillary, intergingival, circular, semicircular, transgingival, intercircular, transeptal fibers) that create the architecture of the dental papilla all belong to the tooth. This debate between implants and endodontics should not exist. Implants and root canals are not alternative treatments. 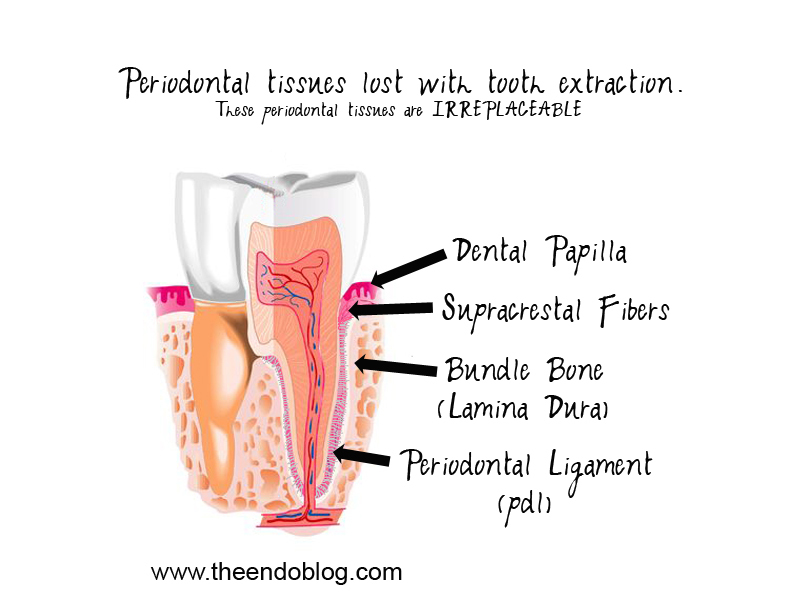 If a tooth and its surrounding periodontium is in tact, we should make every effort to preserve them, because an implant cannot restore these periodontal tissues and loss of these tissues leads to a host of other challenges. Dr. Nowzari hosts a periodontal & implant symposium that may be one of the few (if only) implant CE events that is not sponsored or underwritten with any commercial interest (also available for download). It may also be the only of its type where endodontists and implant surgeons are participate together. We would highly recommend you check it out. Thanks for Dr. Nowzari's link, great lecture very interesting topic. I second your statement, a debate between endodontics and implants should not be given an attention. Thanks for the interesting and informative post. The periodontal and dental implant symposium which was hosted by Dr. Nowzari was really great. 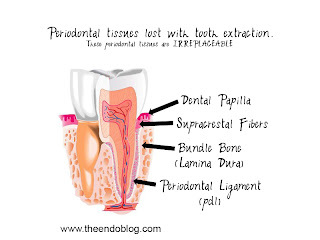 It is true that a large amount of periodontal tissues are essential to carry implant supported teeth. And have there been any studies with regards to the long term effects of dental implants? For example those who had one or more implants earlier in life and then at their old age lost other teeth and needed a prosthesis? I can imagine having those non-removable (implants) teeth can be a problem if all the surrounding ones are gone. Great post. Dr. Hessam Nowzari is an excellent speaker and the dental implant symposium was very interesting. I totally agree that implants and endontics are not alternatives and that both have their own specific situations of use. They do share some similar problems though. This web site is my breathing in, very great layout and perfect content material. good interesting post on dental implant, well explained.